They did our brakes last summer, and all was good for a while, but the squeal is coming back. Not as bad as before, but noticeable and frequent. This is frkn ridiculous. Went the Audi of America route, of no avail though. Took few months of ping pong only too tell me that "they're on national backorder". Lower than my previously reputed and trusted dealer service, currently hypocritically low. Literally disgusted by their indifference and hypocrisy, especially that i only had good past experiences . Yeap, just clocked 20k, use to call them Smiles(from the SQ5), the didn't do my complementary alignment because i missed the 10k/1year cutoff, because i waited FOR THEIR BRAKE PADS, and do it then. Now i know why they had 3 Yelp stars... I'd give AoA negative 3. Just took my 2017 Q7 in with 25K miles. 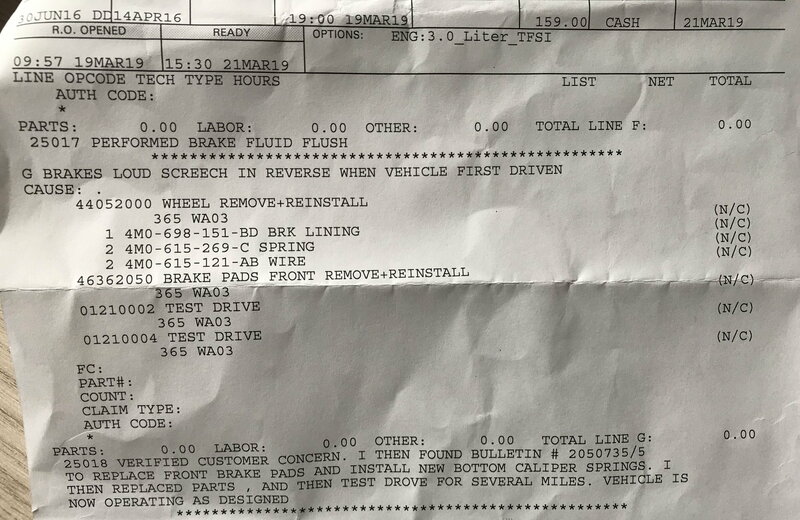 Complained about the brake squeal and the dealer found a new TSB # 2050735/5 related to the issue. Happy now that I can reverse out of the garage without waking the neighbors. Last edited by inline40; 04-06-2019 at 11:24 AM. Hopefully that's a permanent fix. My Q7 is a year old, and zero brake squeal to date. Good luck. I was also happy for almost 6K mikes after they applied the TSB, then the squeal came back gradually. Well after 3 sets of pads and doing the service bulletin twice it still squeals I hate this car and I hate the Audi brand they lost me as a cust forever. The Suv is a huge issue I have had more small things go wrong in this car then any other car I have owned. The dealer is great thank god they help me with everything but as far as the brand they could care less about any of us.......enjoy the back and forth emails and the non call backs.